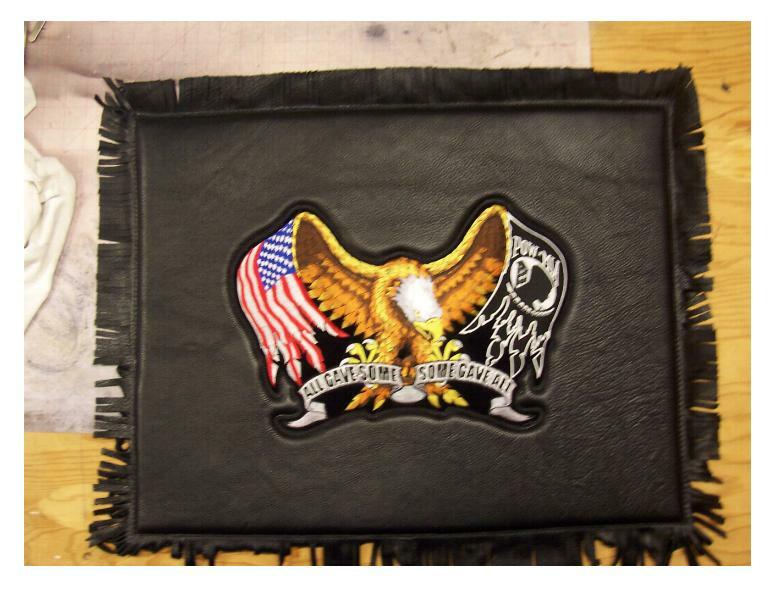 Below you will find items that have been custom made here at V&V Leathers. If you have something special in mind, let us know we may be able to make it for you. 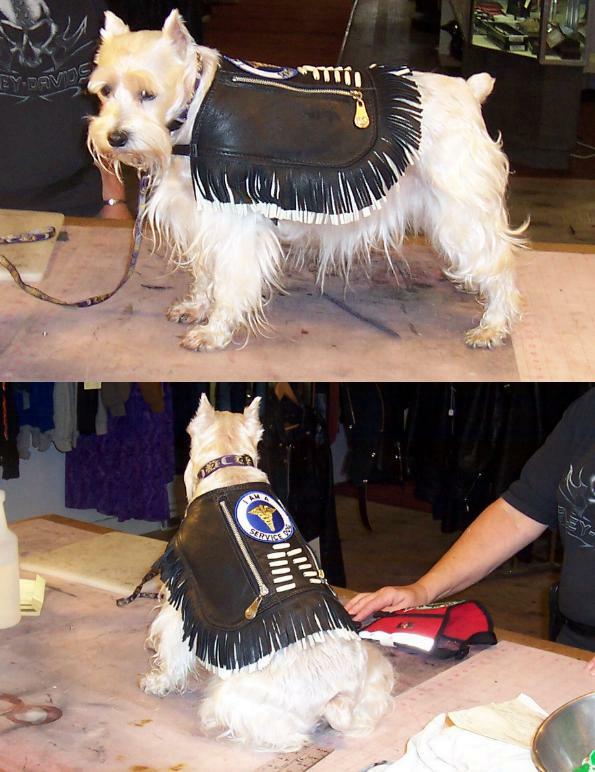 Service Dog Coat with pockets made to match the owners chaps. 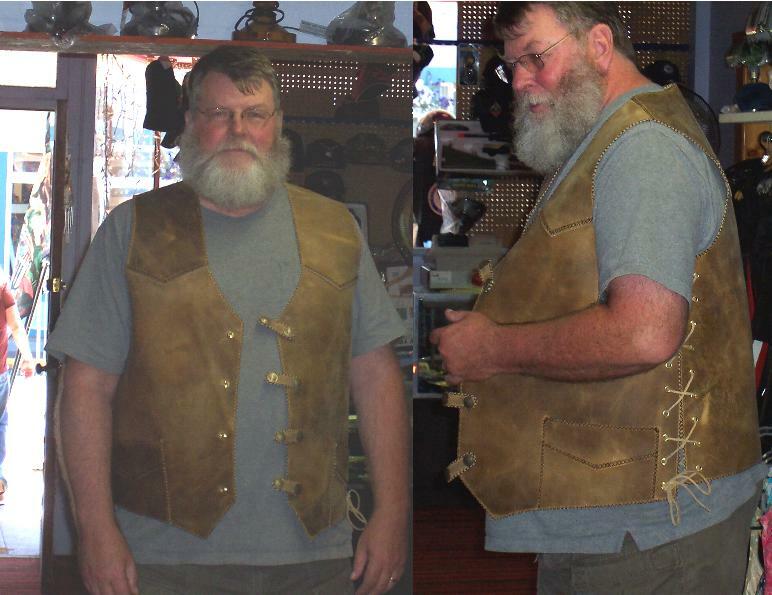 The Talldragoon in his new hand made vest. 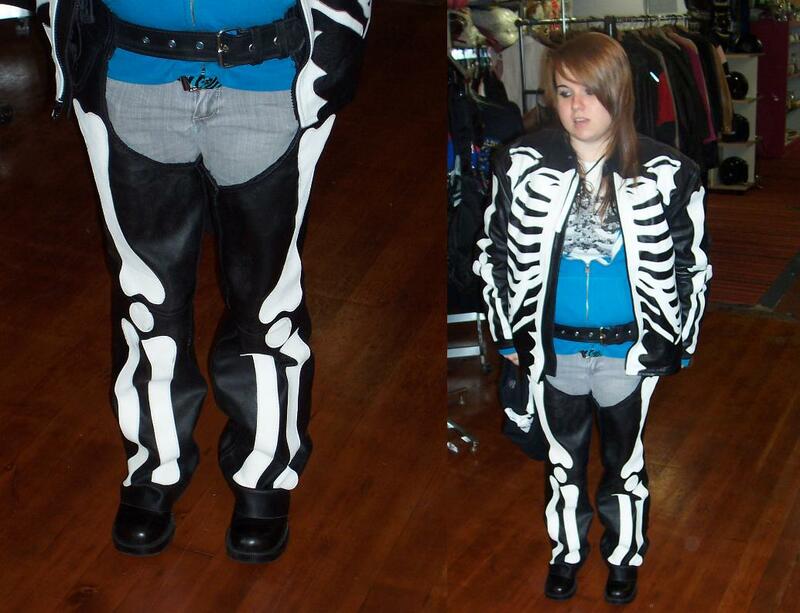 Bones added to chaps to match the jacket. 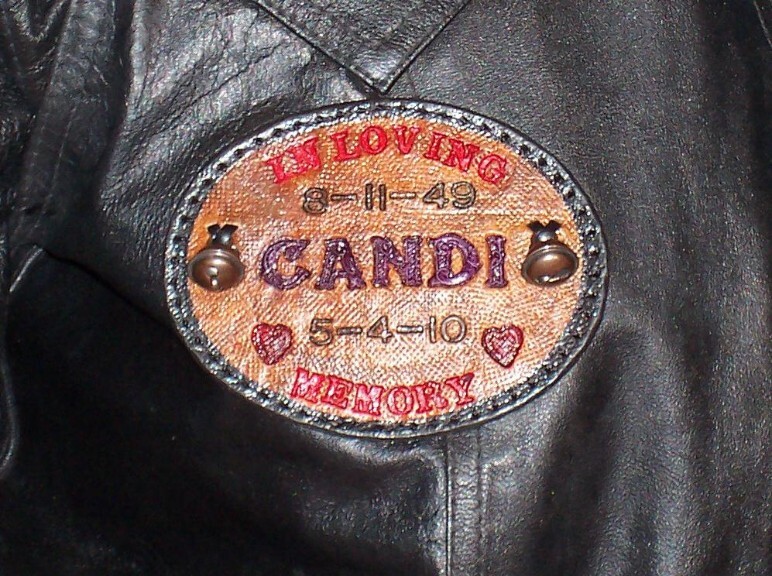 Leather Memory Patch made in honer of the ladies best friend. Blue Fringed leather outfit and baby sized Du Rag made for my grandaughter Sapphire for our annual Vernonia Jamboree. Vest made for western wedding in New York. 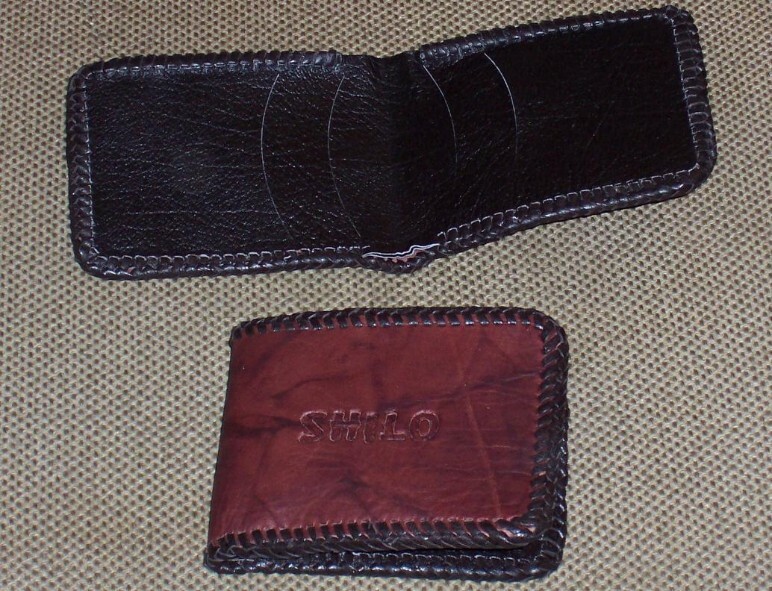 Matching Wallets made for Father and Son. Custom Sandals made to fit this ladys feet exactly. All from real leather, made to last for years, possibly a lifetime. 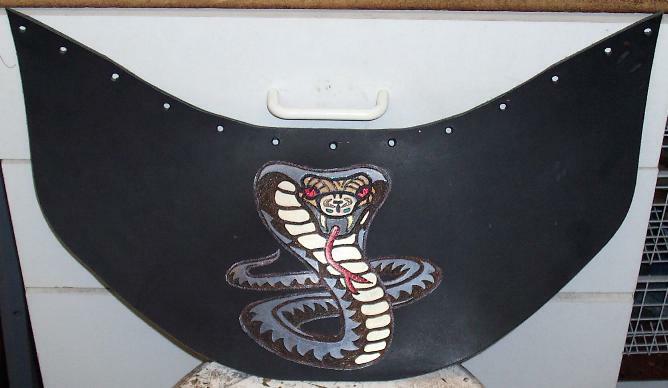 Hand tooled and hand painted mud flap for a Suzuki VL800. Barber Chair, the leather was restored and re-colored here. The arms were recovered to match the original. 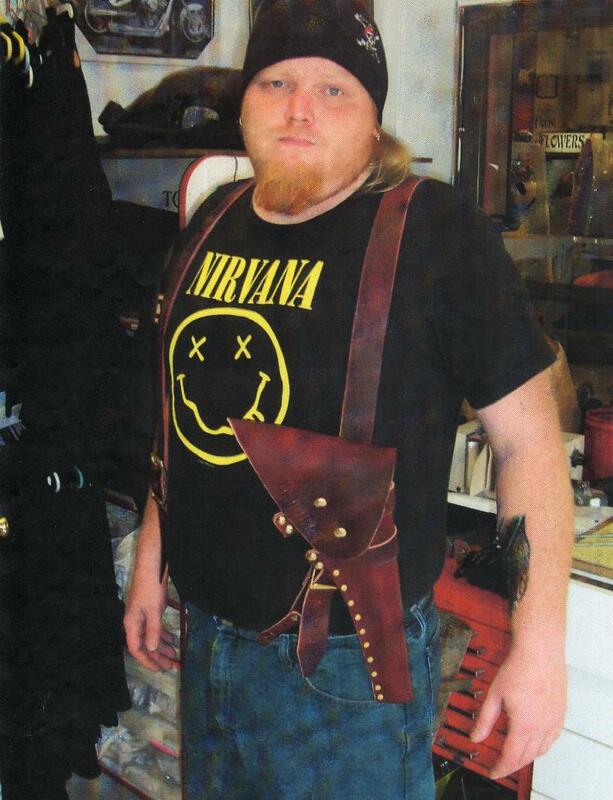 The child seat was recovered in a dark brown cowhide with a spiderweb pattern on it. 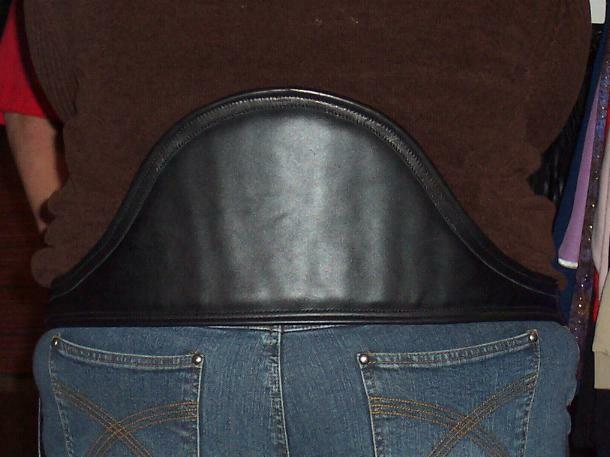 Old pair of cowboy chaps restored and modified for use as motorcycle chaps. Pockets remade with deer horn buttons and 2 walking liberty conchos made for the belt. I Pod / Cell Phone holder. Much easier to listen to music and answer your phone while riding. 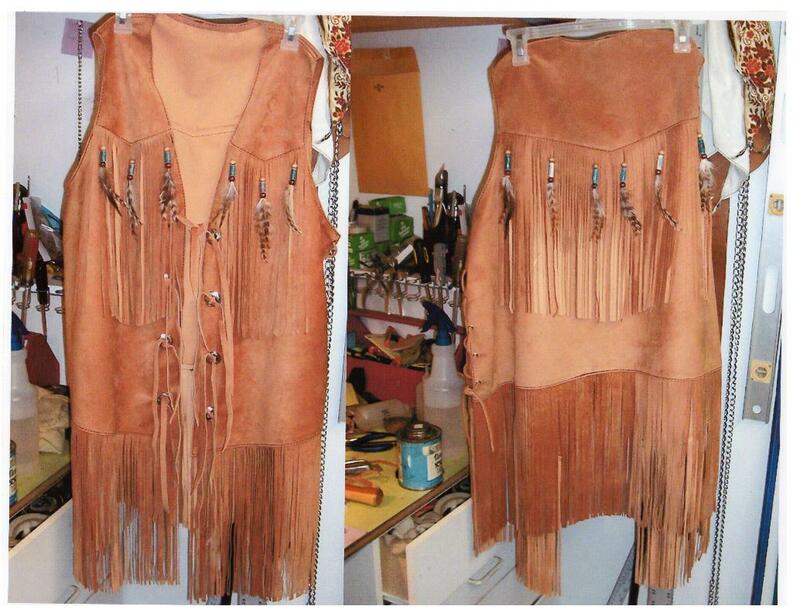 Removable fringe made for a CowGirl who also rides a Motorcycle. 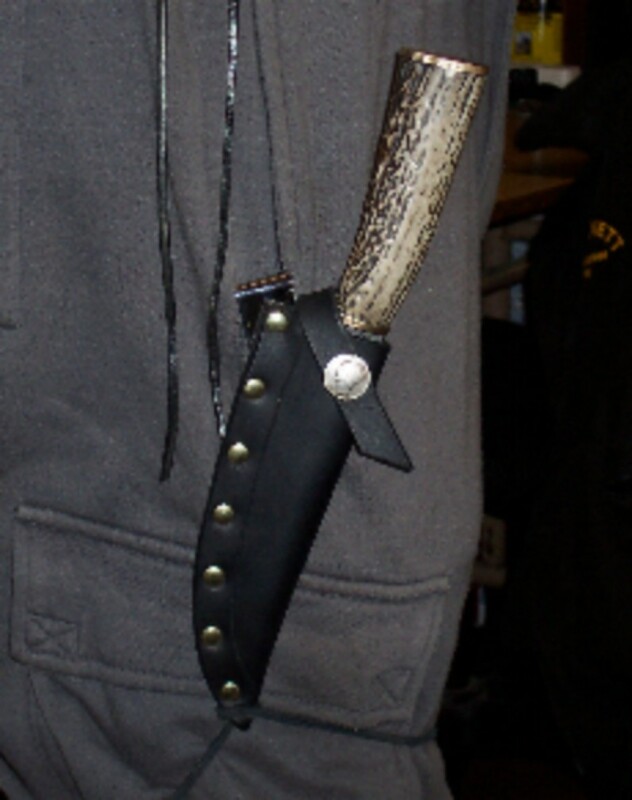 Custom Sheath made with a holster clip rather than a belt loop. Wind and Rain deflectors, Custom Made to fit the engine guards and cut out arround the fog lights. 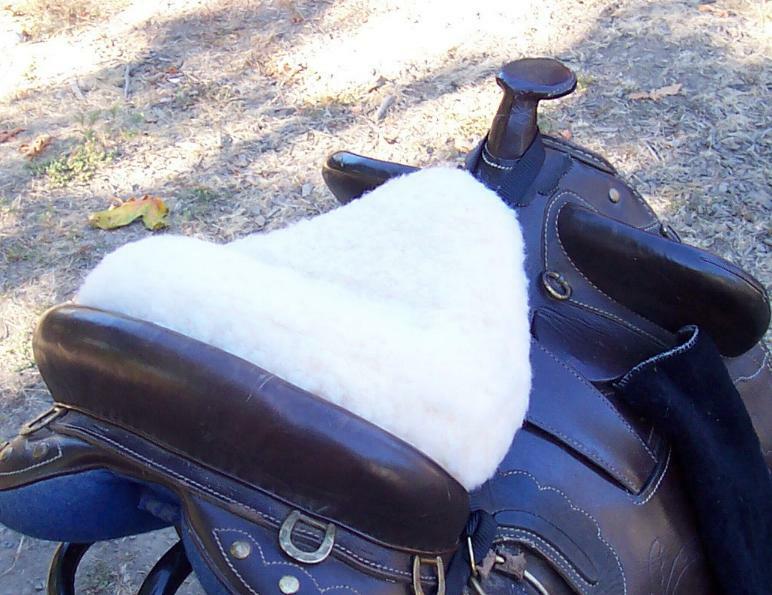 Custom made seat recovered in real leather. Fits early 70's hard tail Sportster. Mud flap made to match original. Made from much heaver leather so it will last last much longer than the original. Arm Band and Hair Tie per customer specs. I used a Mercury Dime in the center of the hair tie. Mr from Oregon City with his new helmet. Uma from New York she has been across the US from Coast to Coast several times. 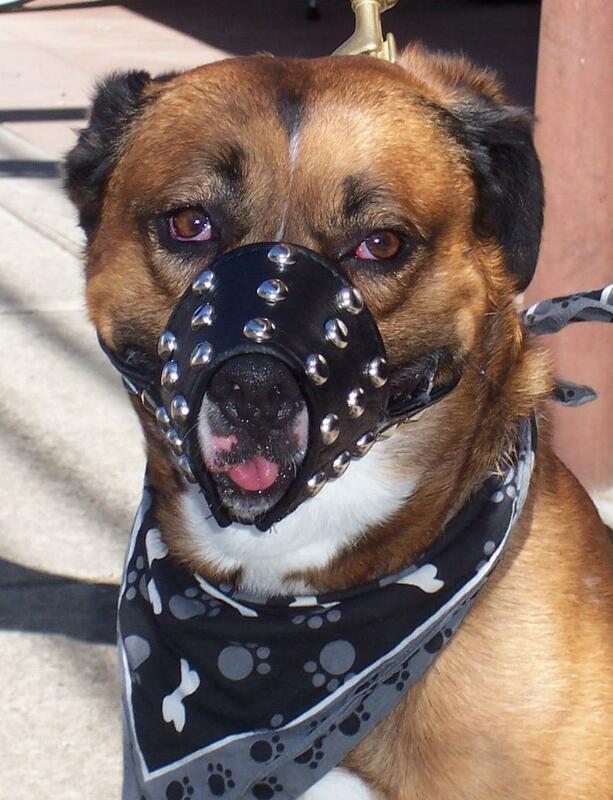 Her owner decided it was time she had a helmet. 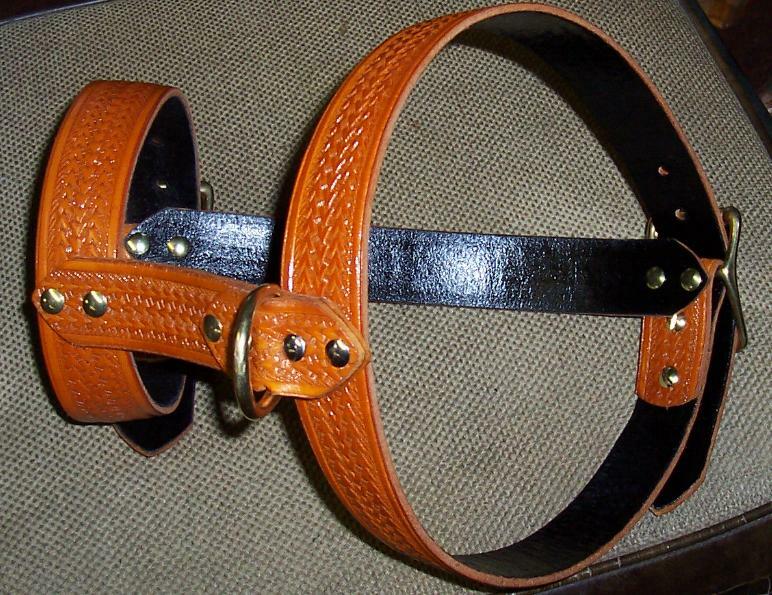 Custom Leather Choker made to customer specs. Custom made vest for Annie Grahame, One of our best customers and good friends for life. Leather hair tie made from drawing by customer. 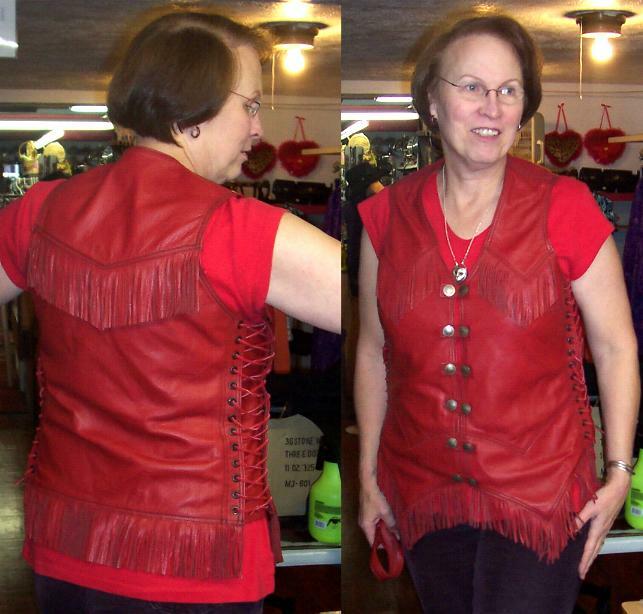 Leather top and thong with fringe made to customer specs. 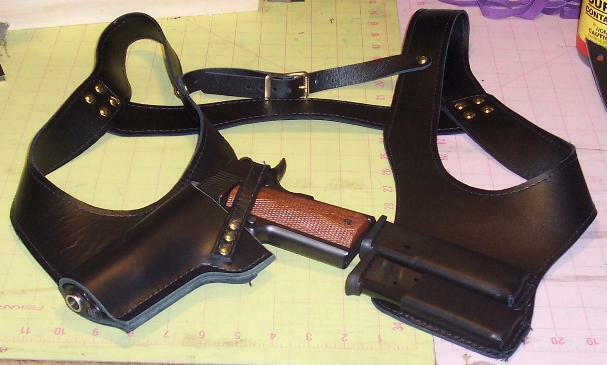 Shoulder Holster for 45 Auto. My Wife's wedding present. 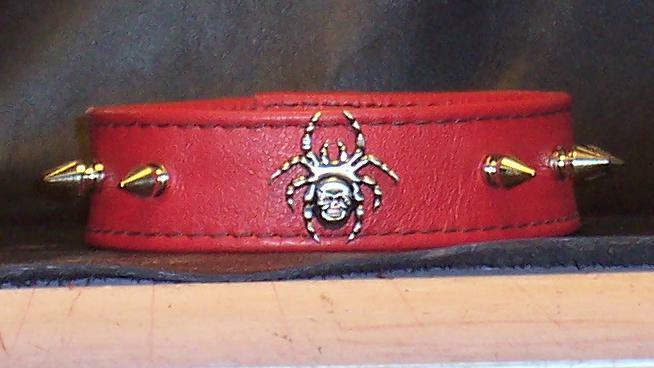 Insulated Chap Belt made for a lady who has metal pins in her back. 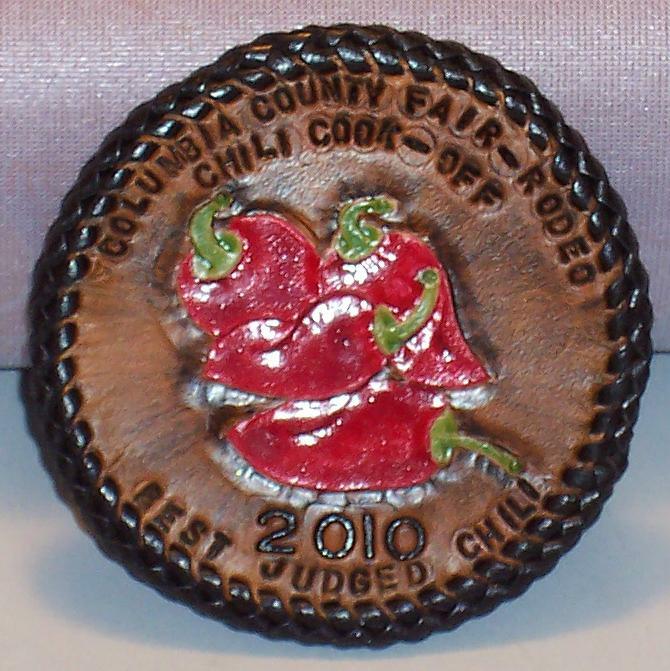 3 Sets of coasters made for the Columbia County Fair & Rodeo 2010 Oregon State Chili Cook Off. Hat bands made for the Columbia County Fair & Rodeo 2009 Oregon State Chili Cook Off.